Cyclesnack: Everything was toasty except the toes! 3F is about -16C. That's what I commute in most days from January through March... -20C is when I start to consider taking the train instead. 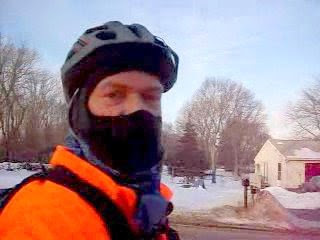 I wear a skull cap under my helet and insulated gloves with windstopper fabric. On my body, I have a t-shirt, icebreaker merino wool sweater and windproof softshell. On my legs, I wear shorts over longjohns and just regular socks and skate shoes. On some of the colder days, I wish I had some warmer gear for my legs and feet, but I survive. I am going to have to work on finding the optimal clothing arrangements. Looks like I am not the only crazy one. After trying this, I think I am going to start riding again to work. I might try doing it on Mondays so that I can do Spin on Wednesdays and Fridays. I was wondering how you were doing pedaling in the cold! It's 70 everyday here in FL. We head back to winter on Monday. When I lived in Montana I would commute and train in single digits. I could never keep my toes warm enough no matter what I did. I still have permanent tissue damage. In Utah, I have been riding in heavy winter boots, wool socks, and heat packs, with xl Powergrips on WTB flat pedals. Old technology still works well.